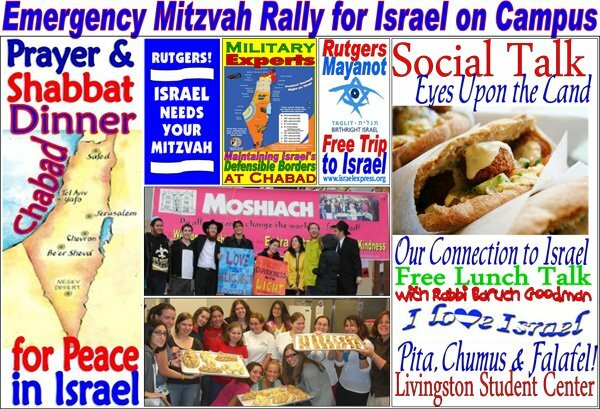 Emergency Chabad at Rutgers "Mitzvah Rallies" for Israel The situation in Israel requires our immediate response, both in terms of mobilizing the student body to understand the nature of the conflict, as well as to inspire each and every student to do something to help Israel in her time of great need. As you can see by our programs this week, Chabad is at the forefront in bringing Israel front and center on campus. This Shabbat, we are holding a special prayer rally for our brothers and sisters living in Israel, especially for our heroes, the brave soldiers in Tzahal, the Israeli Army, as well as sponsoring an Peace in Israel Shabbat Dinner. During the week, Chabad's rabbis and student volunteers will be setting up "Israel Needs Your Mitzvah" booths encouraging students and professors to put on Tefillin, light Shabbat candles, and increase in Tzedokah - charity for Israel. Chabad Rutgers Alumnus Lt. Col. Jesse Arnstein of the US Airforce will be addressing the students next weekend to give a military understanding of the need for countries to have and maintain defensible borders, as well as the role of military in having a free society. Please be a part of the real peace process by doing your share to bring these special programs to campus, and by adding in your own prayers and deeds of lovingkindness. L'chaim to Moshiach now, more than ever.